Photo source: A Nitzsche. Some rights reserved. Chechens live in the remote valleys of the Caucasus Mountains of southern Russia between the Caspian Sea and the Black Sea. They are a strong, determined people with a long history of fighting for their independence. 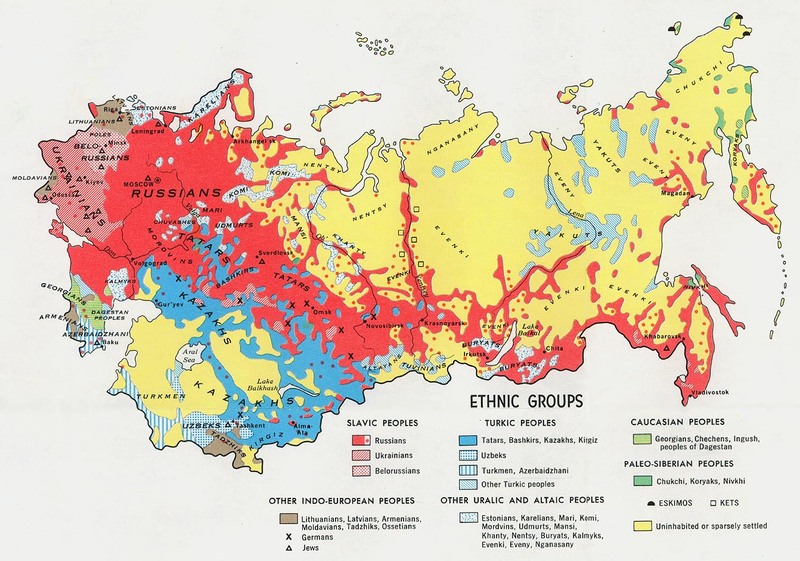 Soviet rule dominated the Chechen during the first half of the 20th century. For years the Chechens had based land tenure upon joint-clan ownership. When the Soviets introduced the idea of property ownership by society rather than by clan, the Chechens fiercely opposed it. When World War II broke out, most Chechens opposed the Germans and fought alongside the Red Army. Despite this, in 1944 many of the Chechens and their neighbors, the Ingush, were deported to central Asia. They were allowed to return after 1968. On October 27, 1991, the Chechen Republic declared its independence. Since then Russian troops have invaded Chechnya to regain control, and as a result much of the nation lies in ruins. Chechens span a variety of occupations and income levels. Most grow grains, vegetables or fruit; others work in oil refineries or are stockbreeders, particularly of fine-fleeced sheep. Chechen women work outside of their homes daily, as do other women in the former Soviet Union. Chechens generally marry outside their own clans. Marriage between blood relations is forbidden within a span of three generations. A dowry is paid by the bridegroom's family to the bride or her family as a guarantee against divorce. Traditionally, a Chechen wife is not allowed to eat with her husband or to speak to his relatives; her role is one of subordination. The core of the Chechen society is the taip, a clan-like organization whose members descend from a common ancestor. An assembly of elders, with their own court, rules each taip. Ruins of church buildings indicate that at least some Chechen had converted to Christianity by the 8th century. During the 16th century Islam was introduced by other peoples who settled among the Chechens. By the late 17th century all remaining ties to Christianity had disappeared from this region. A number of Chechens have received religious training at Dagestan, an important center of Islamic culture located the south of the Chechen-Ingush Republic. Chechens are among the most devout Muslims in the former Soviet Union. Several anti-Soviet uprisings have fueled their religious fervor, particularly the opposition to their deportation in the 1940s. At that time Russia attempted to completely eliminate Islam in the Chechen-Ingush territory. All mosques and other religious buildings were closed. These restrictions only served to boost Islamic missionary work in the area. Following this attempt to discourage Islam, two mosques reopened in 1978. Despite leaning toward Islam, some Christian heritage can be seen in the Chechen language. Their word for Sunday translates to "God's day", and the word for Friday translates to "day of Mary". The Chechens have been referred to as the "Mafia of Russia", and they are generally feared by other Russian groups. Their strong Islamic faith is very difficult to influence. In recent years the rise in Chechen nationalism had strengthened their Islamic beliefs; however, it has also brought devastation upon them in form of Russian military invasion. 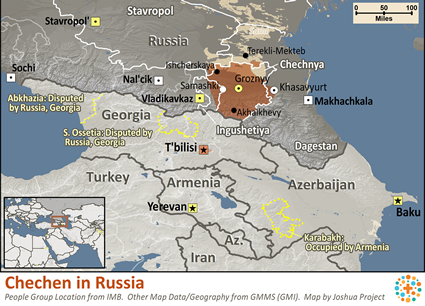 If you lived among the Chechens of Russia, fighting and military action would be commonplace. With so few Christians living there, you would have virtually no one to encourage you in your Christian faith. You may even face torture or death for your beliefs. Although Chechens are a despised people, God does not see them that way. He has a future and a hope for them. He longs for them to know a peace that can only come through the Gospel of Christ. * Pray for the endurance and protection of the few known Chechen believers. * Pray for political stability in the area where the Chechens and Ingush live. * Ask the Lord to tear down barriers to the Gospel so that those Christian workers who live and work among the Chechens will see fruit. * Pray for freedom from war and destruction. * Ask for Christians in Germany and Jordan to have a burden to share the Gospel with the Chechens living in their countries. 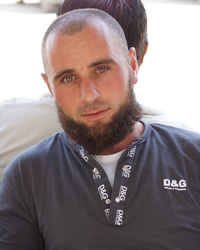 * Pray that the Chechens will have the opportunity to choose Jesus. * Pray that God will establish missionaries among them who are committed to their needs. View Chechen, Nohchi in all countries. Location in Country: Chechnya, Dagestan, and Ingushetiya Republics; Stavropol’skiy Kray; north Caucasus, most in rural areas.